Did you ever wonder how a perfect wine will taste? Of course, the perfect wine for somebody can be different than the perfect wine for somebody else, but for Robert Parker, The Wine Advocate, the wine we propose now for tasting, scored almost there. 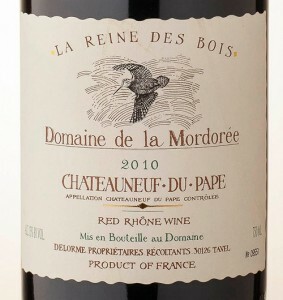 He granted 99+ points (out of 100) to this Chateauneuf-du-Papes Domaine de la Mordoree La Reine de Bois from 2010. As usually, the wine tasting will take place at Restaurant Dada, 94 bis Matei Voievod street (yes, I know, we need to try new places…. we are working on this) on Thursday, February 26th, at 19:30. There are 12 available sits and each one costs 250 lei which includes the wine, the water and our very enjoyable presence.